Introducing Millennial Script! A flirty, timeless handwriting font with a quick stroke and a dancing baseline. Use Millennial for hand-written branding, headlines, product packaging, email signatures, advertising campaigns, book covers and more! • Millennial Script (.OTF & .TTF) – Contains ligatures and multilingual support. • Millennial Script Italic (.OTF & .TTF) – Contains ligatures and multilingual support. 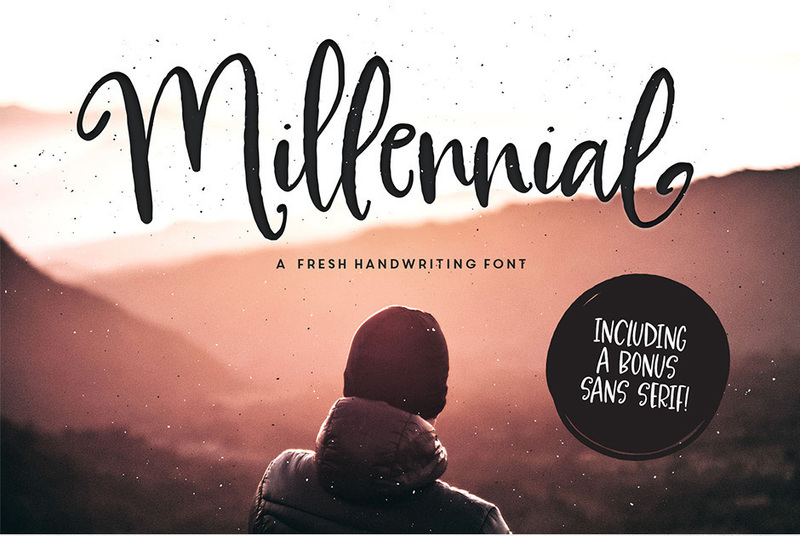 • Millennial Sans (.OTF & .TTF) – A fun, free bonus sans serif to compliment your script set (English language support only). Language Support: English, Catalan, Danish, Dutch, Filipino, Estonian, Finnish, French, West Frisian, German, Icelandic, Irish, Italian, Norwegian, Portuguese, Spanish & Swedish. File size is approx 340KB (629KB unzipped), offered as a single download.